What is Wella SP Luxe Oil? Wella is a well-known hair brand in the world, and it has professional range called SP (System Professional). And they have the launching event for the latest product series; Luxe Oil. SP Luxe Oil is the latest premium hair treatment which contains keratin. So basically it's Keratin treatment which is very good and currently trending among beauty junkies. Keratin is actually natural protein which actually exists in every human's body. It exists in human hair and nail. So what's with having Keratin treatment product when it exists in your own body? These days, hair encounters a lot of things that can damage it like hair drying process and chemical process (hair coloring, rebonding, curling). Those process can cause major harm to keratin in your hair. Ever wonder why your hair is so dry and has split ends? It's because your hair is suffering from keratin loss. SP Luxe Oil is there to save your keratin-loss hair. With Argan oil, Almond oil, and Jojoba oil inside, it will improve the hair structure by moisturizing and revitalizing your hair. SP Luxe Oil gives more shine to hair as well, making your hair looks even healthier! 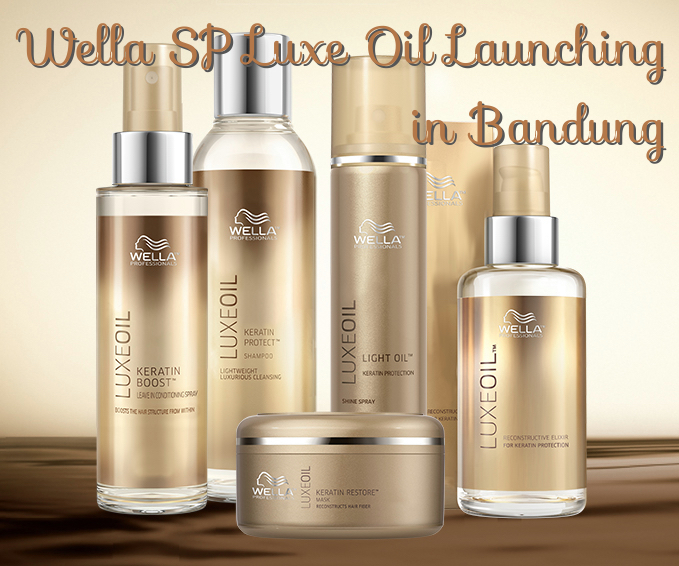 Thanks to Wella Indonesia team, we also had a chance to enjoy Wella SP Luxe Oil Treatment in one of the famous salon in Bandung. It's home salon located in Jl. Bagusrangin 7, Bandung; Hetty Hair. The salon is so homey, with a lot of trees and plants, also there is a small cafe which is integrated with the salon. This salon is most famous for the cutting by the owner; Bu Hetty. If anyone wants to have her hair cut by the owner, it will be available only by appointment. See, how famous it is? So let's see my treatment with Wella SP Luxe Oil! As you see my hair is naturally wavy, and since it's colored, the hair strands are a bit dry and not shiny. Process starts with washing first. During washing, the staff massaged my scalp as well and it feels really good! Not too tense, not too soft. After that, they prepared for mask. The salon itself is very comfy and homey. The mask is put on your hair to restore keratin in your hair and they also massage scalp as well. After blow-dry, the staff put light oil shine spray to add more shine to my hair. And here's my after look with Wella SP Luxe Oil! Overall, I really love how shiny and nice my hair is. Also, the fragrance is sooooo damn nice! I feel "luxe" just like the product name is. Thank you Wella Indonesia and Hetty Hair, especially Mba Santy and Bu Hetty for such an amazing experience with Wella SP Luxe Oil!